A five dollar bottle of wine that is good, and interesting, is a spectacular find. We’ve written about such a bottle from Trader Joe’s, Nero d’Avola, a five dollar bottle. They also sell a Primitivo for the same price. Primitivo is a dark skinned grape from the southern part of Italy, known in the U.S. as Zinfandel. While we don’t often write about Old World Wines, we’re focused on California’s New World Wines, we’ll take a moment to review this wine. Puglia Indicazione Geografica Tipica Primitivo is a tasty wine, suited for a simple weeknight meal, perhaps with spaghetti, pizza or some red meat. Is it a great wine? Well no, but its an interesting wine worthy of consideration and exploration – with a $5 price tag. The fruit came forward and the wine mellowed a bit as it sat open, aerating. 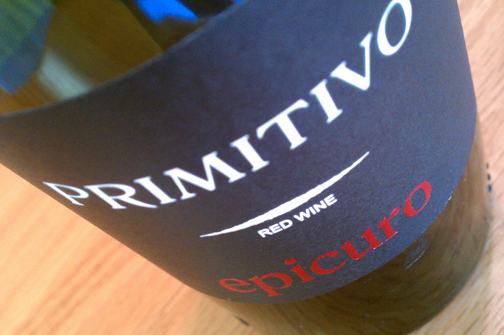 Since the Nero d’Avolo was a good find, we decided to bet five dollars on the Primitivo. And the bet paid off. We thought this was better than the Nero d’Avola, but then again, we’re Zinners. This edition was a 2010 with 14% alcohol. You’ll find it in the German/Italian section of Trader Joe’s wine department. This entry was posted in Primitivo, The Pleasures of Tasting Wine, Thoughts About Wine - Exploding Ruby Flowers On Your Palette, Uncategorized, Zinfandel and tagged bottle of wine, italian, primitivo, southern, wine, zinfandel.